Surprise! We’re in Las Cruces, New Mexico! Our original plan was to leave for Santa Fe on Sunday, but because of snow that was supposed to be coming through (a huge thing to avoid with RVs) we left on Thursday for Las Cruces staying overnight in Tucson to take a more southern, milder weather route. We shuffled a few reservations and will spend five days in Las Cruces exploring the famous white sands before heading to Santa Fe. We spent our last week in Borrego Springs capturing sunsets, interviewing farmers and a couple of days around the Salton Sea – all posts coming soon. We had rain on Sunday and Monday with lots and lots of wind, which stole all the clouds and brought incredibly clear evenings for star watching. Mr. Misadventures got up almost every morning to do sunrise photography. Me? I like my sleep! By the time I woke up and was drinking my first cup of coffee he arrives back for breakfast. Then I work on the computer for about 4 hours, we have lunch and then some days I work another one-to-two hours before heading out for the sunset, or we would go out for a hike or other exploring. We are developing a nice little routine. Jessica has a routine too. Sleep, then eat, then sleep. I guess as long as we provide her a bed and food she doesn’t care where she’s at! She doesn’t particularly love travel days, but she is doing pretty well. She is sneaky though, we have to block every possible way into the bedroom while driving or she will get into a spot she isn’t supposed to be. Don’t need a pancake cat when we open up the slideouts! We went to the weekly farmers market and were able to get tomatoes (! ), avocados, incredible tzatziki and hummus – which we thoroughly enjoyed for dinners outside throughout the week. The sunsets are just spectacular! We also *finally* tracked down dates! Ever since driving into Borrego Springs and seeing all the palm and date trees I have been trying to locate medjools, something Mr. Misadventures and I adore. On our way over to Salton Sea we found a great spot with all things date and these babies are delicious! Lastly I am really excited to start the Quit the Cubicle ecourse. As I explained in my deCubicled post, one year sabbatical is great, but if I can figure out a way to not go back at all, that would be fantabulous! That’s it for this week! Happy escaping! 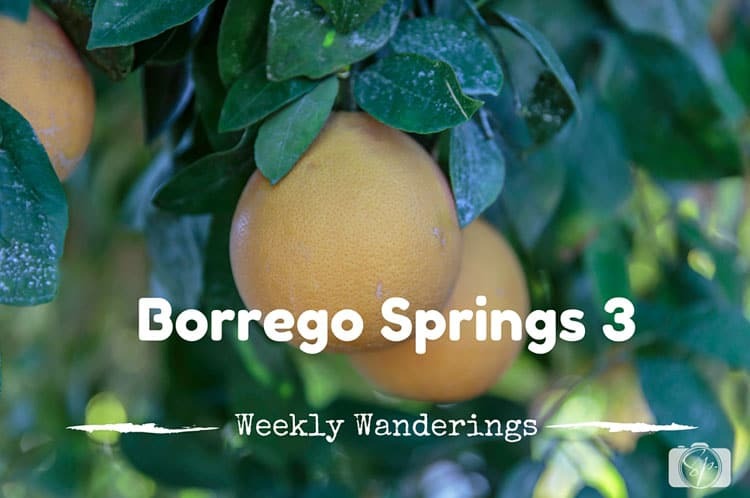 Look out for a ton of Borrego Springs posts coming soon! Follow me on Instagram for real-time activities from Las Cruces! I’ve always maintained (believe it or not) that Nebraska has the prettiest sunsets in the U.S. But that one does look pretty great! And eek — keep Jessica out of that bedroom!! @Katie, I will be going through Nebraska in the fall, so I hope to see some of them. I think I like Jessica’s routine best! 🙂 I really wish I had the motivation to wake up for sunrises.. they really do make some of the best photos. Hummus! Fresh dates! I swear I just want to travel with you so I can eat all this stuff. LOL! 🙂 So so cooL!